This experiment involved making two types of cupcakes: one batch using a packaged cupcake and icing mix and the other made from scratch. We also used a package of decorative cupcake liners which are great for presentation and also serve a functional purpose – they are made of a sturdier paper and claim to be strong enough to use instead of a muffin pan. These cupcake liners did prove to be strong enough to use without a muffin pan and they also made the presentation of the cupcakes very sophisticated. It’s great that these are beneficial from both a practical and presentation stand point! Preheat oven to 350 degrees F. Line muffin pan with 12 liners (not included). Heat 1/4 butter in microwave just until melted. Allow to cool for 5 minutes. Combine cake mix, melted butter, water and egg whites. 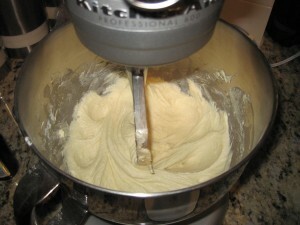 Using an electric mixer, beat for 30 seconds on low, 1 minute on medium. 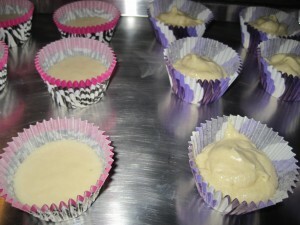 Pour cupcake batter into muffin cups, distributing batter evenly. Use a spatula to scrape mix from bowl. Bake for 16-18 minutes or until toothpick inserted into center comes out clean. Allow to cool completely. Preheat oven to 350 degrees F (175 degrees C). Line a muffin pan with paper liners. In a medium bowl, cream together the sugar and butter. Beat in the eggs, one at a time, then stir in the vanilla. Combine flour and baking powder, add to the creamed mixture and mix well. Finally stir in the milk until batter is smooth. Pour or spoon batter into the prepared pan. Bake for 20 to 25 minutes. Cake is done when it springs back to the touch. There are noticeably more steps involved with the cupcakes that were made from scratch (sift and measure the flour, cream the butter and sugar and add the dry ingredients gradually vs. simply melting the butter, separating the egg whites and mixing everything in a bowl). 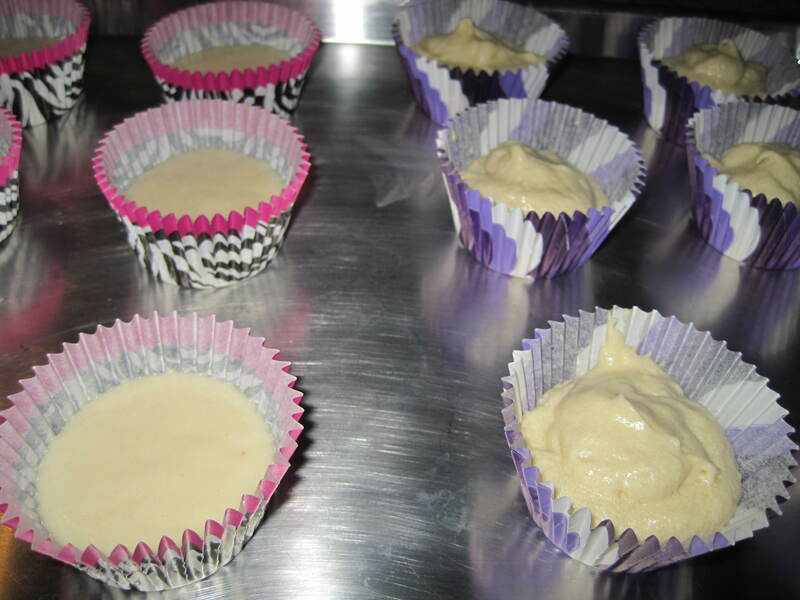 The batter for the cupcakes made from scratch took longer to prepare but resulted in a thicker batter. The batter made from the mix was faster to prepare but gooey and more runny. When the cupcakes first came out of the oven, you really couldn’t see a difference between the two. 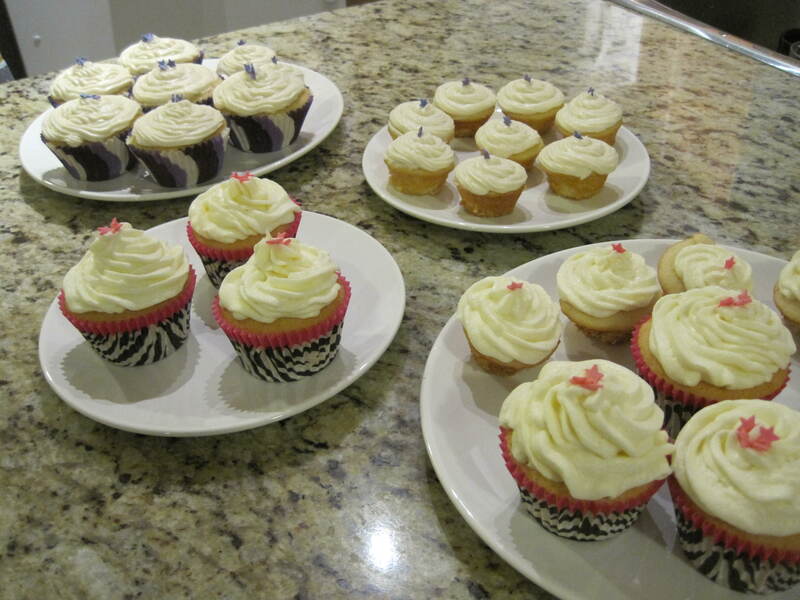 However, the cupcakes made from scratch were slightly more yellow in appearance. This is probably due to the fact that the cupcake mix only called for egg whites whereas the cupcakes made from scratch used whole eggs. 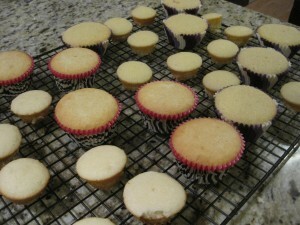 The cupcakes made from a mix were lighter in texture with a stickier surface. They had a slight meringue texture (probably due to the presence of egg whites) whereas the cupcakes made from scratch had a crispier surface and were denser in texture but had a cleaner flavour. There was a noticeable aftertaste that came on after the initial bite of the cupcake made with the mix. 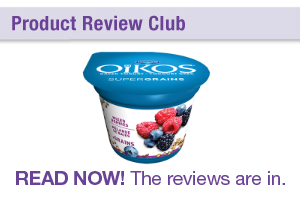 It tasted a little bitter as if the ingredients had taken on a bit of the aroma of the cardboard packaging. The taste difference was still noticeable once the cupcakes had cooled. Using an electric mixer, beat room temperature butter on high until light and fluffy. Add frosting mix and powdered sugar and beat on low until combined. 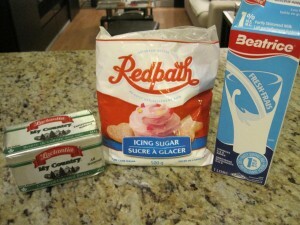 Add milk and beat on high until reaching desired consistency (add more milk if necessary). 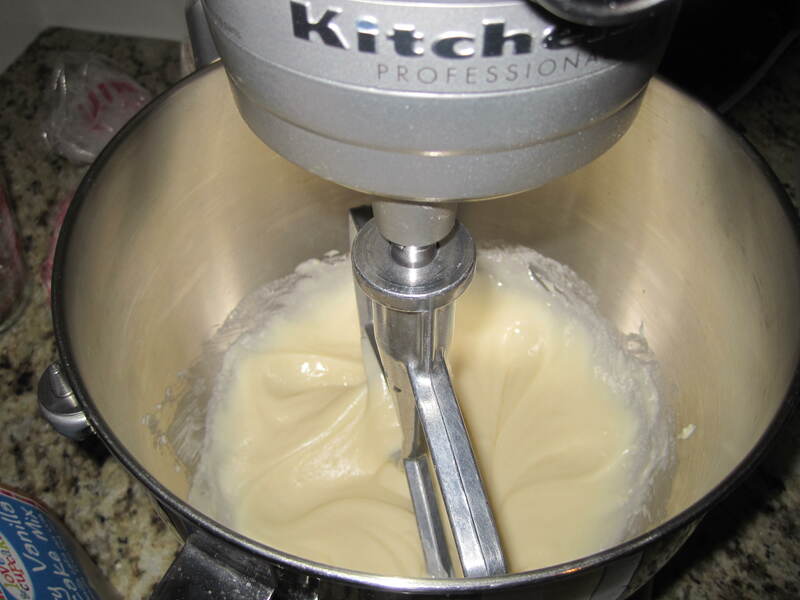 In an electric mixer, or with a hand mixer, cream the butter until smooth and well blended. Add the vanilla extract. With the mixer on low speed, gradually beat in the sugar. Scrape down the sides of the bowl. 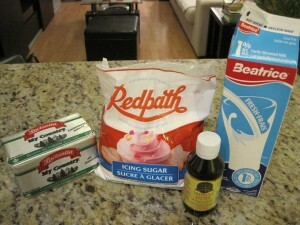 Add the milk and beat on high speed until frosting is light and fluffy (about 3-4 minutes). Add a little more milk or sugar, if needed. 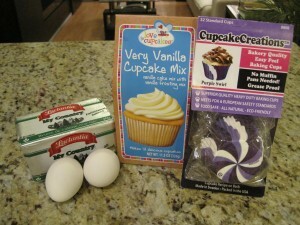 I found it interesting that the mix used the same ingredients you would use if you were to prepare icing from scratch (except vanilla). I was wondering why bother with a powdered mix? I assumed that there was probably vanilla flavouring in the powder that came with the mix and possibly some stabilizing agents. Either way, I find the packaged frosting powder to be unnecessary since you’d be measuring out the majority of ingredients anyway. The taste differences were quite significant though, with the icing that was made from a mix having a bitter after taste. 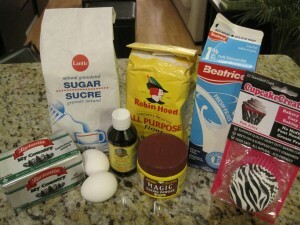 « Vanilla cupcakes – Can you judge a cupcake by its cover? 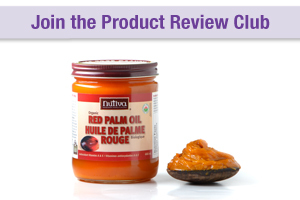 » What do you call an apple that tastes like a grape?